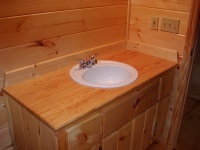 Your cabin kitchen countertop is one of the interior design choices that you will have to make for your log home. There is a huge range of choices from tried-and-true to cutting edge innovation. Let's see how they stack up. You can’t beat laminate for performance and value. Practically indestructible and impervious to hot pans and stains, laminate has been the reliable choice for many years. While considered boring by some, the enormous range of colors has been supplemented by new finish styles that mimic stone. Combine a honed surface with a double bull-nose rounded edge and you’d swear you have a granite counter top, but at a fraction of the cost. 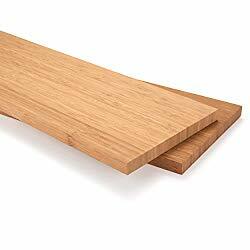 Another option is to use pre-made edge trim with a built-in Corian strip for durability. 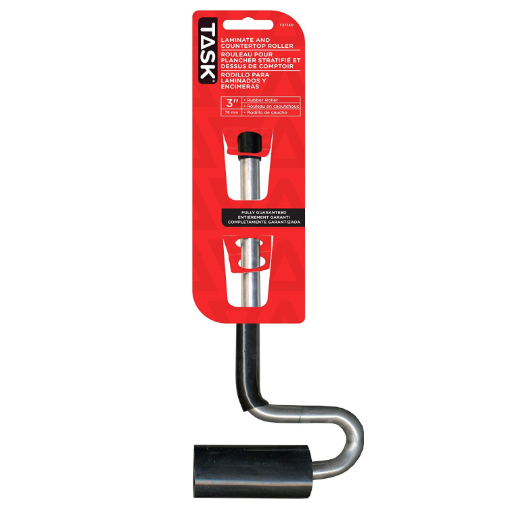 If you are installing the laminate yourself you will need some specialty tools, such as a laminate trimmer and laminate roller. Limitless possibilities with regard to tile sizes and patterns offer you a chance to install a truly custom kitchen look in your log home. You can also vary the grout pattern and even the grout color to add further visual highlights. Installing tile is relatively inexpensive and is a good DIY task if you enjoy getting your hands dirty. Drawbacks to cabin tile countertops include the need to seal the grout lines and keep them from staining. Some people don’t like the uneven surface that tile produces. This is especially true if you use something like these 2"x8" bone subway tiles normally used for a backsplash. An alternative is to use these 12'x24" slate tiles. While the surface would be rough, it would certainly result in an unique countertop. Long considered the ultimate kitchen countertop surface, stone offers a classic, solid look and feel along with excellent resistance to heat. You must care properly for stone countertops as they are prone to staining if not sealed, but the new sealers are nearly maintenance-free. Granite countertops come in varying thicknesses and you can save a bit of money by opting for a thinner slab as long as it doesn’t span too far. The edges can be built up to simulate a thick slab of granite. Granite countertops are an outstanding complement to log homes and they last a lifetime. Take care of them in the short term with Formula 409 Natural Stone Cleaner. 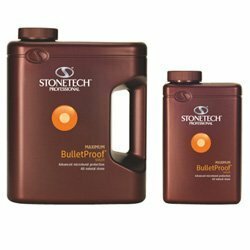 For long-term care, it's a good idea to seal your granite countertops with a sealant such as StoneTech BulletProof Stone Sealer. Marble countertops are beautiful but even more susceptible to stains than granite. If you have a busy, working kitchen with lots of activity, you’d be better off with something that requires a little less care and attention than marble. Wait…don’t laugh. 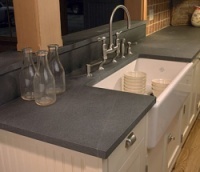 Concrete countertops are one of the hottest new developments in cabin kitchen countertop design. Not only is concrete a green building product, the possibilities of a custom concrete countertop are endless. By adding tints to the mix and even aggregates like colored glass or stone chips you can customize a look all your own. Concrete countertops are perfect for unusual shapes where a custom designed countertop is called for. Smooth and solid, they add a contemporary feel to a rustic log home kitchen. Like stone, concrete has an inherent warmth in the winter and a cool smoothness in hot weather. If you’re interested in building your own concrete countertop, check out this excellent book by Fu-Tung Cheng, “Concrete Countertops”. Using a pre-built mold, you can make your concrete countertops take whatever shape you want, include drain boards, soap holes and chamfered edges, insert coins or shells into the matrix and color the concrete almost anything you want. Smaller concrete counter tops can be poured upside-down in custom-built forms and then flipped over when they're installed. Larger kitchen counter tops are typically cast in place because of their weight. Solid surface countertops have been around for a while and generally require specially trained fabricators and installers. They may be a little cheaper than genuine stone, but the real benefit is their durability and stain resistance. If you’re looking for a monolithic look with the sink made of the same material as the rest of the countertops, solid surface is the way to go. Even if you get a scratch it can be buffed out since the color goes completely through the material. Engineered stone is expensive but a cabin kitchen countertop made from this doesn’t require the regular care and maintenance that granite does. Wood countertops have a special appeal in log homes. They perfectly complement the rustic, homey feel of the logs and add warmth to the social center of the kitchen. Wood countertops must be carefully made and sealed to prevent water damage, especially near edges like the sink where water could soak into the cut edges under the sink. But with care and attention you can have a unique and beautiful countertop to go with your log walls. Wood countertops are not limited to oak butcher block kitchen islands either. Any solid hardwood can be used, the harder the better. Check out our page on the Janka Hardness Scale for the relative hardness of various types of wood. Although the Janka Hardness Scale is designed to be used to compare hardwood for suitability as flooring, the same principle applies and any wood near the top of the list could be used for wooden cabin countertops. An eco-friendly alternative to wood is to use bamboo for your cabin kitchen countertop. Technically a grass rather than a tree, bamboo is fast-growing and considered a sustainable resource. The distinctive grain adds character to your kitchen and there is even a plywood called Plyboo so all your cabinet boxes can match the bamboo look. can be attractive, functional and green come many new cabin kitchen countertop choices made of paper and other recycled material. These products utilize recycled material compressed and bonded with resins or cement to produce extremely hard and durable countertops. Other recyclables include metal and glass countertops. If you’re looking for an industrial or contemporary look for your cabin kitchen countertops, stainless steel is durable, easy to clean and seamless. Fabrication can be expensive but stainless steel countertops are nearly indestructible. For a rich, deep color and a smooth feel that will find you lingering to stroke it as you walk past, soapstone countertops are the ultimate in sensual appeal. Soapstone is timeless and unique and only requires a little care: mineral oil should be wiped on regularly. 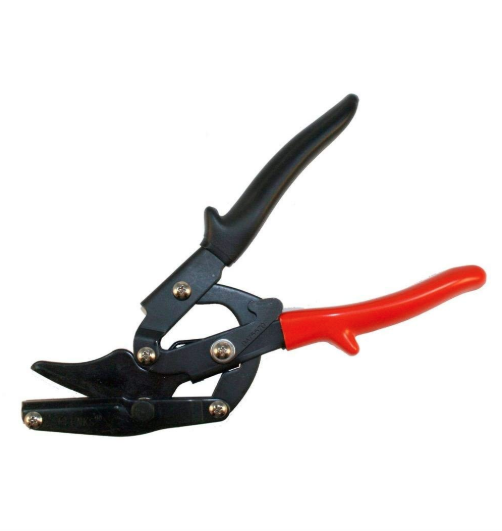 Its non-porous nature means that spills and stains are not a problem. Soapstone is more likely to dent than it is to crack or chip like the more brittle granite or marble countertops. With the multitude of choices available for a cabin kitchen countertop you can find something that will match your cabin design and your budget, providing a durable and functional worktop for the busiest room in your log home.